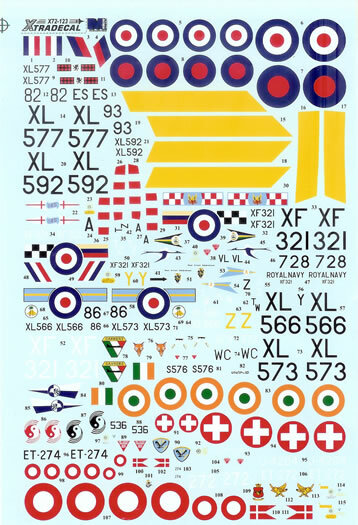 Decals for 19 subjects with colour-printed painting and markings guide. The Hunter is a popular modelling subject, although the two-seat version somewhat less so than the single seat fighter. A possibly slightly less attractive appearance aside, this may be to do with the availability of two-seater kits in 1/72 scale. Two-seat Hunters have been restricted to the rather basic Matchbox/Revell with two-seater option, conversions by Aeroclub, PJ Productions and Air Conversions, and more recently some superb resin multi-media kits by Olimp Pro Resin. However conversions are not for everyone and relatively pricey resin kits can be off-putting for some. All that may soon change however as Hannant’s house-brand, Xtrakit, produced by the Czech MPM Group, is soon to be released. This should put a modern affordable injected kit of the two-seater within reach of 1/72 Hunter fans. As such Hannant’s Xtradecal decal release reviewed here makes very good sense as a compliment to the forthcoming kit. 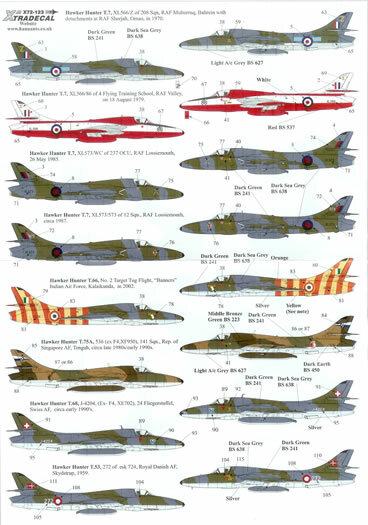 The subjects covered by this sheet cover 12 RAF squadrons, two “Raspberry Ripple” schemes, four Danish options, and one scheme each for Switzerland, India and Singapore. The decals are supplied in Xtradecal’s usual A5 window envelope. The instructions are nicely produced in colour and clearly indicate markings placement. 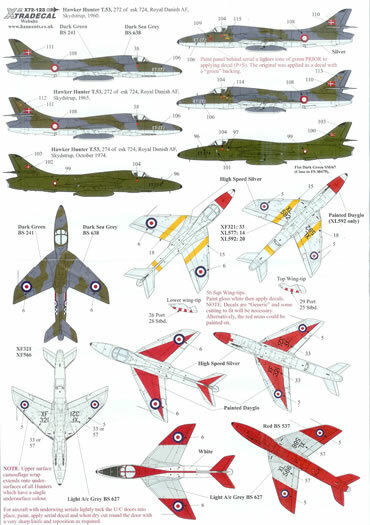 A brief written description of the paint scheme is given for each subject. Paint references use RAF paint names and BS or FS codes as applicable, plus not surprisingly a list of Xtracolour codes for the colours required. The decals themselves look to be superbly printed and with excellent colour density. In fact I feel I should comment on how much better the production of this set appears compared to an older EE Lightning set I once used. The Decals themselves are much more clearly printed with good fine detail, and registration looks to be excellent. The all-colour 4-page instructions are also a giant leaps forward from the black and white outlines of the older set I experienced. 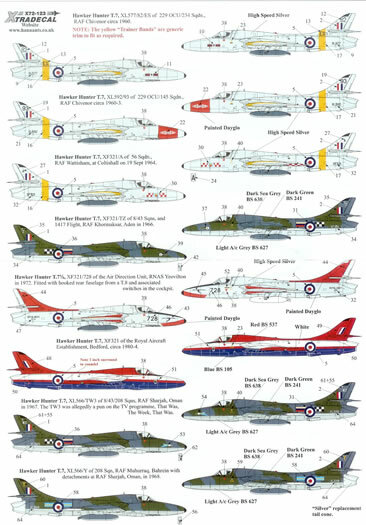 This is a superbly produced set of some very attractive and interesting Hunter trainer schemes. Great for either your old Matchbox/Revell offering, or the superb Olimp Pro-Resin kit, but more likely a “must have” order in conjunction with the Xtrakit 2-seat Hunter when it hits the shelves - Definitely recommended. Thanks to Xtradecal for this sample.